The image quality is sublime! It's true 4K and has impressive brightness. Although technically easy to use, it is fragile and doesn't have the best build. In terms of price vs. image quality, this is up there with the best in the marketplace. Summary: Before reviewing the Optoma UHD60, we were not really sure that a truly affordable projector could ever deliver both HDR and 4K features effectively. After reviewing this projector, we are glad to say that we have never been happier to be proven wrong. We highly recommend! While it is easy enough to fall into the trap of considering projectors to be an old, outdated form of technology, the fact of the matter is that these devices are still very much relevant in today’s home entertainment market. In fact, for those looking to gain access to the fully immersive experience provided by the movie theater in their own home, projectors are actually the best route to take, as a giant, flat screen televisions with a comparable screen size will quickly become prohibitively expensive. However, despite the fact that there are plenty of high-quality 4K projectors on the market today, most of them are still outrageously expensive. While this makes sense, as access to excellent home theater technology has never been cheap, it is hard for us to imagine shelling out $5,000 to $10,000 for a big-brand projector. Here at Digital Art Projectors, we pride ourselves on finding the best affordable projector options for our customers, as we understand how difficult it can be to find the right device, even when one is working off a reasonable budget. With this in mind, we are proud to both review and recommend the Optoma UHD60 projector, which offers a great 4K experience for far less money than some of its brand-name competitors, to our readers. Overall, the Optoma UHD60 is a great DLP unit that is capable of throwing out tons of great ultra-high definition content on whatever surface you choose to display it on. To give our readers a better idea of just how great an option the UHD60 is in today’s budget-friendly projector market, we’ve compiled the following review, which we hope will serve as a valuable guide as you determine whether or not this enticing and affordable projector option is right for you. Who is the Optoma UHD60 projector for? Typically, when it comes to narrowing down on who a 4K projector might work best for, we don’t have any difficulty. After all, with the steep price of today’s digital projectors, consumers typically fall into two categories: those who want great visual and are willing to pay for it, and those who want great visuals but can’t find a projector that fits the bill within their price range. When it comes to the Optoma UHD60 projector, we are proud to say that we can confidently recommend this unit to anyone who is willing to spend a couple of thousand dollars on their next digital projector. This price range really allows for the Optoma UHD60 to hit a market sweet spot, where there will be plenty of demand for this affordable unit from projector novices and veterans alike. With this being said, we never want our readers to feel as if they are spending far more on a projector that they can realistically afford. With this fact in mind, we do want to say that the Optoma UHD60 might not be the right choice for those who aren’t ready to make a relatively large investment in their home theater setup. We ask that those in this situation don’t get discouraged, as there are still a number of impressive, dirt-cheap projectors available if you’re willing to forgo having access to cutting-edge features like UHD or true 4K resolutions. What unique features does the Optoma UHD60 offer? Native, True 4K Resolution: In our eyes, the ability to have access to in-home true 4K video is a huge benefit to any projector-dependent multimedia setup. However, all too often we have looked into projectors (some of which we have already reviewed on this site – we encourage you to check them out if you have not already) that fail to offer a true 4K resolution at an affordable price. Thankfully, this is not the case with the Optoma UHD60 projector, as it packs stunning, true 4K resolution-based visuals into an exterior case that is easy on the eyes. In our opinion, if you value having access to the highest resolution currently available on the market today for an affordable price, then you can’t go wrong with the 4K offerings of this Optoma model. Super Affordable Price Point: Okay, we understand that this is technically not a “feature” in the traditional sense of the word, but this projector is such a great deal that we just had to dedicate a little extra time to highlight this fact. The fact that this projector manages to offer stunning true 4K visuals and sharp, bright pictures on almost any screen is impressive. However, such features only become more impressive when one factors in that the Optoma UHD60 is one of the most affordable professional-grade projects on the market today, especially considering what you get out of the box. Yes, affordability is not really a feature, but it is still worth noting in our eyes. Impressive brightness to light up any room: With a standard, out-of-the-box bulb rating of 3,000 Lumens, the Optoma UHD60 has enough power to light up even the brightest of rooms. While brightness is a favorite topic when discussing projector technology, it is frequently overlooked, as a strong brightness rating can make the difference between being able to use your projector in a room with residual lighting or having to set up your home theater in a pitch-black space. Strong brightness ratings are complemented by a robust bulb life, which means that the average user won’t have to worry about the hassle of swapping out their projector bulb for years to come. Reliable picture quality in both standard and UHD/4K definitions: While it might seem counterintuitive to consider strong performance in standard definition settings to be a benefit of a UHD/4K projector, the fact of the matter is this is an oftentimes overlooked aspect that many modern projectors fail to deliver upon. Luckily, the Optoma UHD60 is able to take whichever resolution settings you decide to throw at it in stride, which helps to ensure that users will always have access to the highest quality viewing experience possible, regardless of their personal preferences. Great 4K performance to boot: Once again, it may seem silly to keep pointing out that a 4K projector is able to deliver high-quality 4K content, but we just can’t get over how good the Optoma UHD60 is at its job, especially when one considers its ultra-affordable pricing. Access to true 4K visuals at this market tier is extremely rare, so it is worth another mention before moving forward. Low input lag: This factor is of relatively little concern for those who intend to use their new UHD60 projector for watching movies, delivering presentations, or sharing photo collections with family and friends. Yet, those who are looking to add a projector to their gaming setup should note that the Optoma UHD60 manages to keep input lag to a minimum, which is a huge benefit for any gamer. After all, enjoying the full screen, immersive images provided by a projector is great, but what good is such a device for competitive gaming if it prevents you from performing at your absolute best? Super long lamp life: With an estimated lamp life of 4,000 hours in full power mode, 10,000 hours in eco mode, and over 15,000 hours in Dynamic Black mode (which saves power whenever possible), the lamp that comes with your Optoma UHD60 will last for literally years to come, which goes a long way towards limiting the costly and time consuming effects of projector maintenance. If some major issue were to occur, Optoma offers a standard, 2-year manufacturer’s warranty, so there is no need to stress about the off-chance that your new projector kicks the bucket shortly after being taken out of the box. An annoying flicker when in eco mode: Unfortunately, for whatever reason, the image luminance of the Optoma UHD60 is seemingly unsustainable in eco mode. To get past this weird issue, we suggest relying on either Bright or Dynamic Black mode (which will allow for the life of your lamp bulb to be extended significantly). Good news is that the UHD60 operates with extremely low fan noise regardless of the setting, so in theory, you could get the same lamp-saving effects of the eco mode by manually reducing brightness and utilizing one of the modes mentioned above. No 3D option: This is not a huge disappointment, as most (if not all) of the 4K projectors in this price range fail to deliver on 3D features, even for relatively old resolutions like 1080p. Still, it is worth mentioning, as you might have 3D in mind as defining projector features. If this is the case, then we suggest you look elsewhere for your next device. Bulky size and poor build quality: Despite the sleek and attractive casing utilized by the Optoma UHD60, unfortunately, there are more issues than meets the eye in this case. The UHD60 is far bigger than almost all other projectors at this price range, which does contribute to a very low level of fan noise, but could present some issues for those hoping to take their projector with them on-the-go. Bulky size is one thing, but the shoddy workmanship that becomes apparent after looking at this projector for an extended period is almost inexcusable. From a noticeably cheap lens shift knob, which is enough to barely get by, to a flimsy casing that can easily be deformed (or even destroyed) if the projector were to be unintentionally dropped, it is clear that Optoma cut costs when it comes to the overall build quality of this device. To some extent, this is to be expected, as you can’t get the best of both worlds (in the sense of awesome features and great build quality). Still, we can’t help but feel as if this was a lazy oversight by the design team at Optoma. What is an alternative to the Optoma UHD60? If you feel that the Optoma UHD60 is not the best option for you, there are still plenty of other great projector options out there to be hand. In particular, we feel like the Epson Home Cinema 4010 4K PRO-UHD Projector could be a good alternative for those who feel that the questionable build quality of the UHD60 may be a deal breaker. While the Epson Home 4010 can typically be found for about the same price as the Optoma UHD60, it isn’t quite as bright. However, the visuals provided by the Epson Home 4010 are still fantastic, especially when one considers the relatively low expectations typically set for this price range. One important thing to note – compared to the Optoma UHD60 the Epson Home 4010 is built like a tank. While it weighs almost ten pounds more than the Optoma model, which could be a concern for those looking to travel with their projector, the Epson Home 4010 cinema is built with far, far better attention to detail than the UHD60. Furthermore, if you are able to get by without native 4K playback features, the similarly priced Epson EH-TW9300W offers a really strong value for the money. At the end of the day, we know that shopping for a digital projector is a highly personal decision driven by each individual’s own tastes and preferences. With this in mind, we wanted to offer these alternative projectors as possible options, as it would be unfair to our readers if we failed to be forthcoming with other excellent projector options throughout this review. 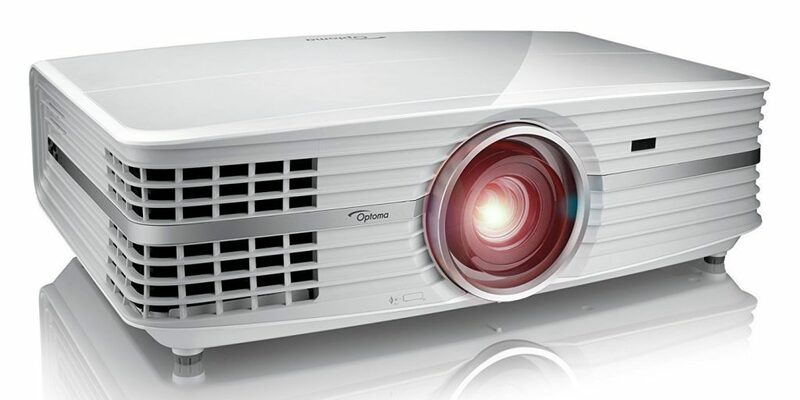 Even though the Optoma UHD60 is a few years old at the time of this writing, it is still a great projector option for those looking to capitalize on the rapidly falling prices associated with 4K projector technology. As mentioned above, there is a laundry list of great features and benefits associated with this immensely affordable projector, most of which we were not able to cover within this review alone. However, no projector is able to check all of the boxes needed for a “perfect” product, and the Optoma UHD60 is no different. 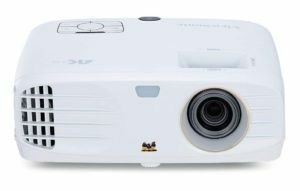 With serious build quality issues that reflect the fact that the team at Optoma really had to cut some corners to get the price down, this fragile projector is sure to break if moved often, as would be the case for those hoping to use the UHD60 for professional presentations or trade shows. Overall, if you are in the market for a very affordable native 4K projector and want to ensure that you get the best price possible for such features, the Optoma UHD60 is a fantastic option. With this being said, we would like to caution those who are planning on moving around this projector frequently, as such actions are almost sure to result in a broken or damaged unit due to its unbelievably fragile build quality. Before reviewing the Optoma UHD60, we were not really sure that a truly affordable projector could ever deliver both HDR and 4K features effectively. After reviewing this projector, we are glad to say that we have never been happier to be proven wrong.